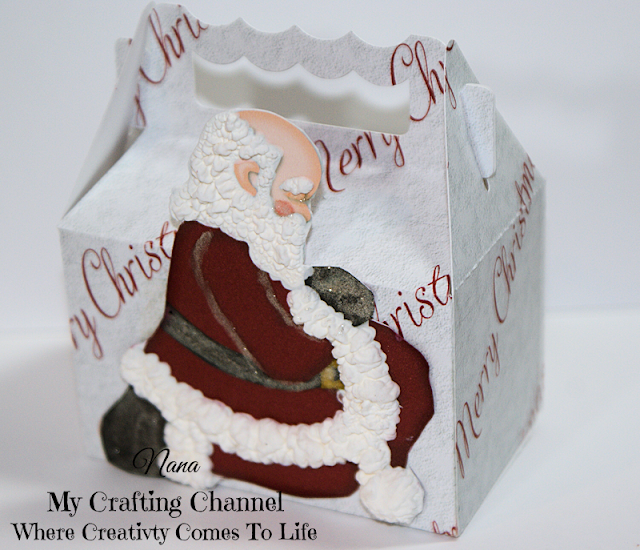 My Crafting Channel: Think Christmas Blog Hop! Hop started at 12:00 AM ET November 7th and will end at 11:59 PM ET November 8th. Come see what the talented ladies on this hop have created to inspire you with Winter & Christmas craft ideas! There are 7 stops on this hop, and some of the blogs are offering blog candy! PLUS a HUGE GRAND PRIZE! If we have 200 people join us for the hop, following each blog, and leaving a comment on each blog, Santa will be giving away a Silhouette Cameo to one lucky FOLLOWER who leaves a COMMENT! (USA & Canada addresses only for the Grand Prize.) The winner could be any Follower who leaves a COMMENT on any of the blogs in the hop, so be sure to follow and comment on them all!! A complete link list of each of the blogs in the hop is at the end of the post. Tuesday, November 10 at 9:00 AM ET. Just check each blog to see if you WON! Let's get started with this Christmas Party! For the hop, I created some treat boxes and gift bags. Let's start off with the gift bags. 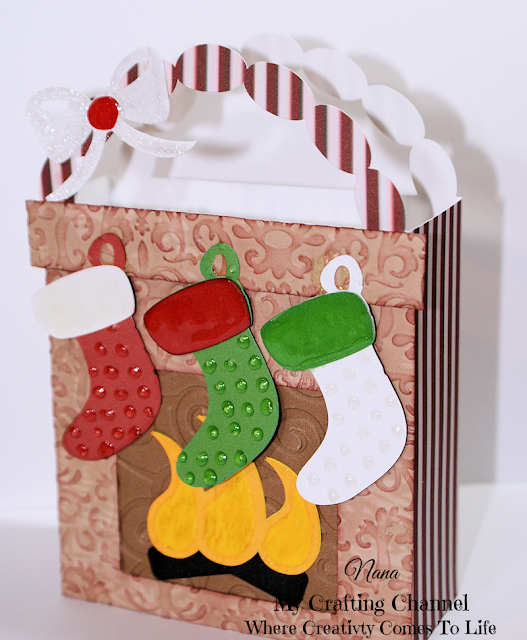 First we have an adorable little bag with a Christmas Fireplace scene. 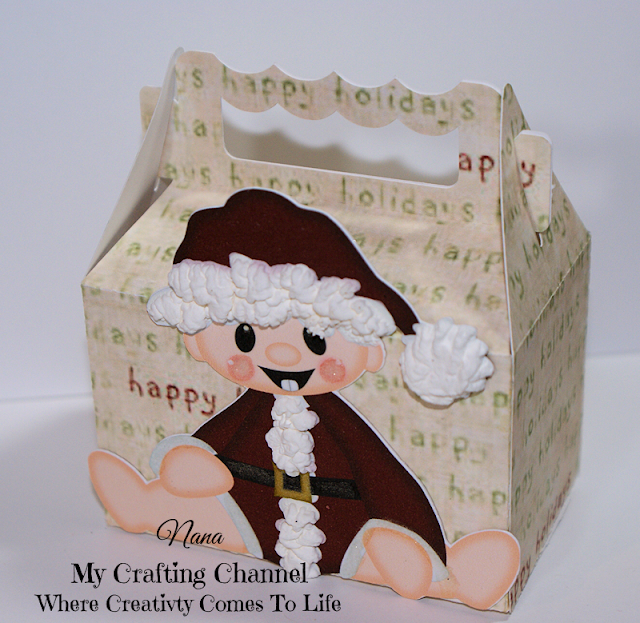 Next we have Santa's Bag which come complete with 4 little boxes that you could use for those extra small, extra special gifts. Now onto the treat boxes. First we have this super cute festive Gingerbread. Back of box has a To: and From: tag. Next we have this happy Little Snowman. Now we have this beautiful Praying Santa. His fur, hair and beard actually look real. Now just look at this little cutie. She is all set for a girly Christmas. This little Birdie sporting her Santa has is so preciously cute . We know at some point in time Santa had to be a baby this I'm sure what he looked like all Jolly, Cute and Cuddly. 2 Files from Little Scraps of Heaven. You can click the images for complete details. Thank you so much for hopping along with us today! Be sure to tell your friends to hop along too so Santa can do a drawing for the winner of a Silhouette Cameo! Don't forget to FOLLOW this blog, and leave a COMMENT before moving on to the next one. Merry Christmas! PLEASE NOTE: To keep the post as short as possible I did not do the recipe for the projects. If you are interest in files and materials used I will be adding the recipe for each on Tuesday after all the WINNERS have been announced. Oh my! I can't stand it they are so adorable. That fireplace bag is so inviting! I love the colors and fun patterns you have chosen for your bags. I LOVE the Santa kneeling at the manger. So much inspiration! Those are great for the holidays! I look forward to your post on Tuesday with how they are made! Oh my...you are going to be set for Christmas boxes...a great start...could not even begin to pick a favorite!!! Oh my gosh, these are ALL fantastic little treat boxes and so fun to put gifts in for Christmas:) I love them Nana!!! WOW I love seeing your 3 D creations always and this post is a visual treat...wanted to know how did you get the fur and hair to look so gorgeous ! Love all your projects! Awesome. Thank you for sharing. Have a wonderful crafty day. all of these boxes with the images are so darn cute! Thank you for the hop! These are so adorable! What a great way to start hopping! I am in awe!! Beautiful job on everything.. I love all of you projects and your treat boxes are adorable! I can't believe how amazing that Santa Fur came out. Great job. Beautiful bags. The person that is going to receive the presents in these boxes is lucky. Nana, I am blown away at your awesome talent!! Wow, each project is wonderful. I love Santa and the kneeling Santa is one of my fav. Love them all. These are WONDERFUL! Thank you for sharing your talents! All of your Christmas projects are awesome. Praying Santa and the fireplace box are my favorite. Great job. You've been busy! Super projects!! Loving that Santa!!!! oh my gosh..they projects are allll amazing. I would love to receive each and every one of them. Oh my goodness! What a busy lady you have been! I love how real the hair and fur on Santa looks. Great job on all of your projects! Wow!!! You did an amazing job with all your boxes. I can't wait to get started. Thanks for sharing. All of your projects are precious!! All of your gift bags are absolutely adorable! I love them all! My goodness have you been busy, look at all those cute boxes! Such wonderful projects! Thanks for having me and thank you for sharing! What adorable projects. I love all your boxes. I love the praying Santa. Great job!! I can think of all kinds of things to use those little boxes for! Great ideas on decorating - you are really getting me in the Christmas mood! Oh I love that Santa box!! They are all so cute. Wow, your projects are fantastic! You were a busy lady! Super cute projects! I love the variety of the little gift boxes you created. There's something for everybody! I think the stockings by the fireplace is my favourite - although it was tough to choose! Wow you have been super busy!! Love all your great projects, great job!! Love all your projects so cute! Thanks for sharing. Cute projects. All the projects are wonderful. 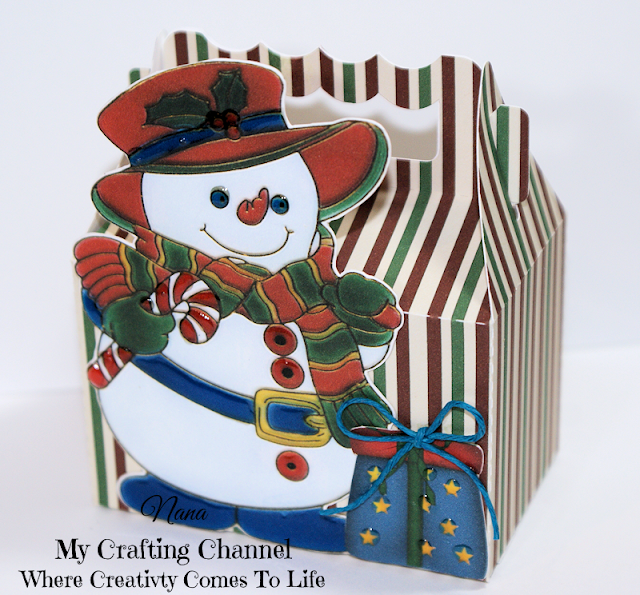 But I especially love the snowman box ... it is just adorable! I collect gingerbread men, so I love the gingerbread box. Are you really giving away a Cameo Silhouette? Love all of these! If I didn't have 600 students I would make these for little Christmas gifts to them! Love the fireplace bag! Oh wow, you've been busy. They all look great. I really like the real fur look. All of your gift bags are really cute!!! Thanks for the inspiration! Adorable little gift boxes! Great job!!! Such Adorable treat boxes!! I just love all the details you added on these!! 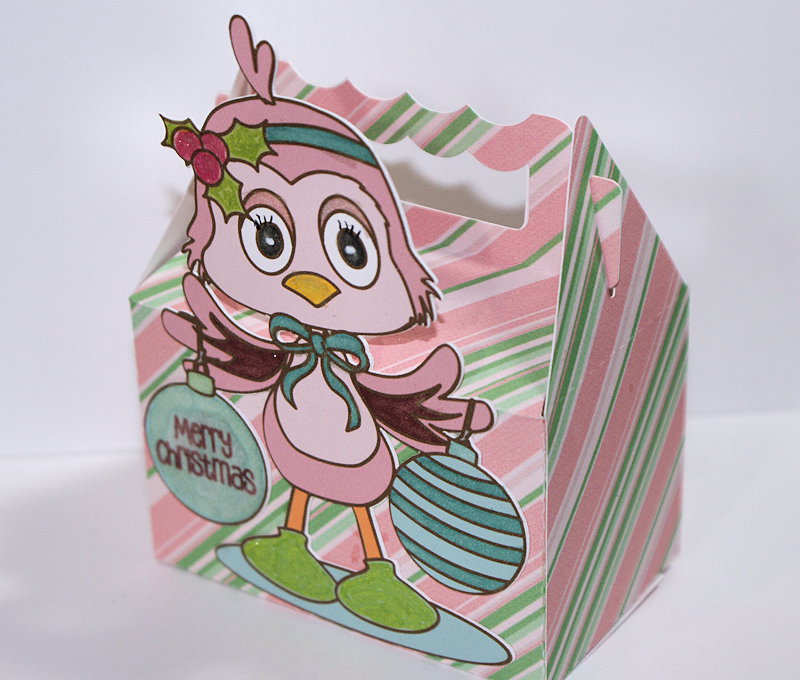 Love these treat boxes... they are so adorable! Great projects! 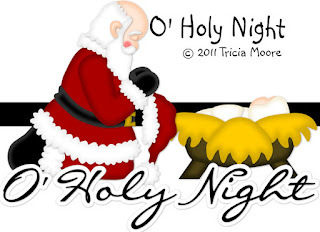 The praying Santa reminds of the meaning of the holiday and is so darn cute. I love the treat box with the little boxes. Wonderful job! Thanks for sharing. Your projects are wonderful! My favorite is the Santa kneeling, love that one. Nana, your creations are terrific! Love all the bags and boxes. Your gifts this year are going to be packaged fabulously!!! I can't decide which of your adorable projects is my favorite. I love them all. I think the Treat box with the Gingerbread man might just edge the others out. Thanks so much for sharing. What fabulous projects- Loving all the treat/gift boxes, super cute!!!! Such amazing projects!! I can't believe how many you put together!! Thanks for sharing. Very nice, I love all of them. Super cute boxes. You've certainly gotten a head start on the holidays. Your boxes/bags are fabulous. The fireplace one is my favorite. The texture on the stockings is extra special. Thank you for sharing. Always something to be inspired by. Love the boxes. They would be awesome for school party. WOW!!!! Love all these adorable, cute, fun, fabulous boxes!!!! You did a awesome job, Nana!!!! TFS!!!! Have a great day. Super cute treat boxes! I totally love each of the unique designs! Love all of the fun details you added to them! Oh my....love treat boxes and these are so cute. Thank you for the inspiration and a change to win a Cameo and possibly blog candy, love it! You have outdone yourself with these! They are all so fabulous. I have a sleigh that I fill with treats every December to keep by the front door for any visitors we might have. These would be perfect! Thanks so much for sharing so much creativity with us. 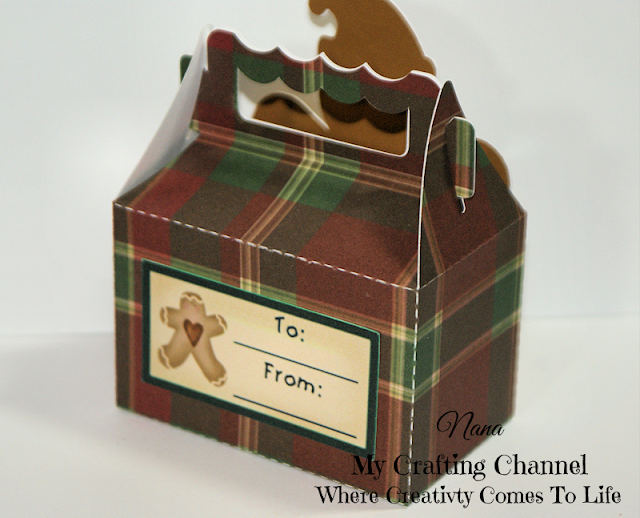 These boxes would be perfect to gift a few Christmas cookies! Love them all! They are all fabulous! What a lot of work! Great job! 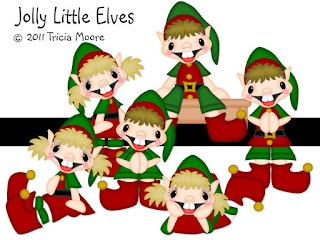 these are too cute...all of them, but my all time favorite is the praying santa. i am in love with him. great job on these boxes! WOW Nana - what fabulous gift treat bags! Love them all!